Is Jane Right…That It’s Time to Rethink DRTV? I recently read a post on the WARC website called “Time to Rethink DRTV” which summarizes thoughts by Jane Christian, the head of business science at MediaCom UK. In it, Jane describes changes she believes need to happen in DRTV. It’s interesting to see an article about DRTV pop up on WARC. Usually the content ranges from excellent analyses based on solid statistics to articles that are general cheerleading for digital. But what we don’t often see is anything about direct response television. To my mind, DRTV definitely needs a change. Our business has been run according to incredibly limited measurements of impact since its inception. And despite over a decade of primary focus on retail impact, most media companies remain stuck in these old ways (despite extensive claims about attribution and clever retail analysis). Yet DRTV is a powerful medium because it influences direct sales as well as all your sales channels – retail stores, distributorships, web distribution of all flavors as well as phone sales. That said, I think Ms. Christian’s got it wrong. 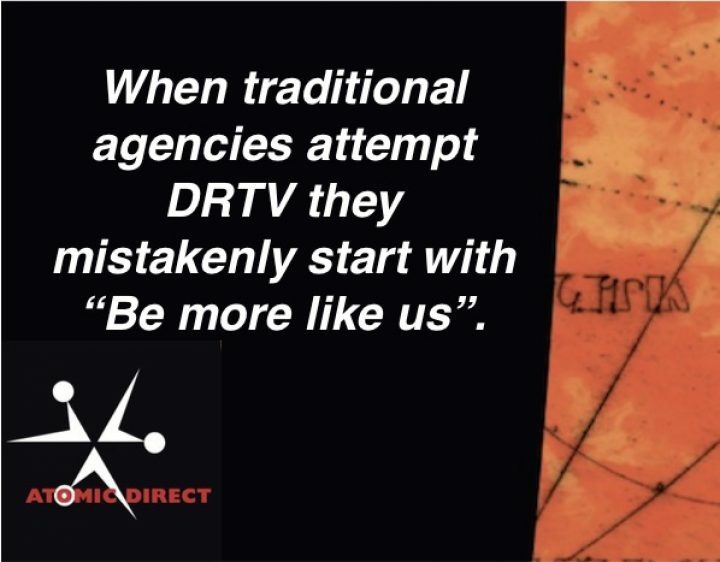 This article reminds me that almost everytime a traditional TV creative or media planner works with DRTV they start with “you DRTV people have been doing it all wrong – you should be more like us”. As a result, lacking sophisticated understanding of the medium, here’s what we encounter in the article. Actually, the frequency at which a spot airs is an accident of following the best direct response. So there’s no “planning for high frequency”. And her belief that there’s frequent consumer viewing of the spot is also flawed. “Airing often” is not the same as viewers exposed often. DRTV doesn’t run as much on big networks – it’s on low viewership stations. And research (from Ehrenburg-Bass among others) tells us that audiences on lower viewership stations are in a constant state of flux. So even if a campaign is presented on station X quite often, it’s unlikely that the ad is generating high per viewer exposure rates on that station. She suggests “DRTV spots in peak airtime can be super effective”. This one is funny. First, considering direct response, peak airtime is rarely effective. This doesn’t mean there aren’t other impacts that direct response measures miss. BUT… I have a guess about why she reaches this conclusion – if it’s based on quantitative analysis. In attribution work, statistical analysis ALWAYS rewards higher priced airings more than is justified by their impact per dollar. Given that she is from the traditional world, neither Ms. Christian, nor her analysis partner ThinkBox, have a background that would lead them to detect this error. Think about it this way: 1,000 small airings may be your absolutely most cost effective media. But you could also spend that same money on 5-10 large airings. Each of those large airings will create a statistically convenient clear spike. But none of the small airings will create that statistically convenient spike. And yet, the combined impact of all the small airings will be bigger than combining the few large spikes of the bigger airings. Unfortunately, statistics cannot be manipulated to find the small impacts. And so heavy reliance on statistics rewards the inefficient. In fact, Ms. Christian’s suggestion is not new. I’ve heard the same from attribution operations who are careless or lack DRTV experience. In the US I’ve heard Google, among others, make this exact error in their vaunted “we can tell you everything” projects. And I’ve seen clients seriously harm their overall business by following advice like this. The question of ad exposures has been around for ages. And for all the things we don’t know about how exposure levels work, I do know that it’s impossible to determine the optimum exposures to achieve peak DRTV effectiveness. Where are you going to do this? Surveys? Consumer recall on this issue is extraordinarily weak. Statistics? Can’t determine it with stats either. This is broadly true. Ads that air during NBA finals (for example) create relatively lower immediate response but can still be highly effective at driving later web and retail response. How SHOULD DRTV media buying change? To achieve best total media impact, advertisers and buyers need to be willing to accept somewhat worse DRTV trackable cost per sale or cost per acquisition. But they’ll also find that the slight loss in trackable sales is more then made up by the increase in poorly trackable retail or web sales. At Atomic, we ask buyers to follow a multi-pronged set of goals that achieve more total impact. For us this is merely the first step but we’ve seen it drive dramatic results (like driving millions of units out the door with 2-3 month campaigns). But we’ve been surprised at how few media buyers are able to work with complicated planning and execution metrics. The majority of buyers fall back on traditional methods – either response measured or traditional Nielsen demographics and CPM style buying. Neither delivers optimal impact from DRTV. It is good that WARC and Ms. Christian see DRTV as important enough to write about it. But it remains sad that they failed to recognize those things that make DRTV particularly powerful. But let’s not let that stay away from what IS true: DRTV campaigns do need to mature the way they buy media.